Melt butter in a medium saucepan on medium heat. Stir in flour and cook one minute, stirring the entire time. Stir in milk, salt and pepper, stirring frequently until mixture boils and thickens. Bring a pot of lightly salted water to a boil. Add macaroni and cook 8-10 minutes or until al dente. Strain pasta. To the milk mixture add both cheeses and stir until the cheese melts. 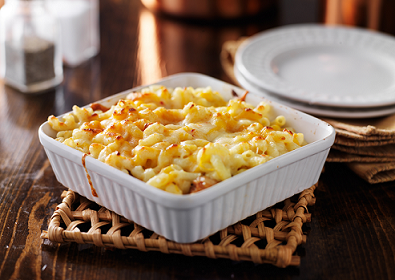 Combine macaroni noodles and cheese mixture in a baking dish. Mix well. Bake in the preheated oven for 30 minutes, or until the mixture appears bubbly. Let cool for 10 minutes before serving.